Detective Lucas McCarthy finally apprehends "Meat Cleaver Max" and watches the electric chair execution from the audience. But killing Max Jenke only elevated him to another level of reality. Now Lucas' family is under attack, his sanity in question, and his house haunted. Aided by a disreputable college professor, can Lucas reclaim his mind, house, and family? Following in the trend, House III has nothing to do with House, or House II, which is fine. 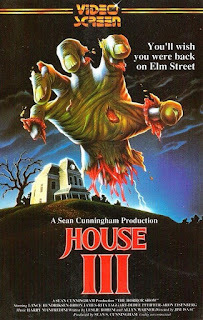 That said, House III was never meant to be a House film at all. Following in the footsteps of the Hellraiser series, House III was originally call The Horror Show, and was scripted as a stand alone film. In fact, in some releases it carries The Horror Show as its tag line. This, in itself, is the only real flaw in the film. It's not really about a House. In fact the climax isn't in the House at all. Well, it is, sort of. Anyway. The film begins with Detective Lucas McCarthy catching serial killer Max Jenke. It's a bloody showdown, McCarthy loses his partner, and after the arrest he suffers with some serious PTSD. 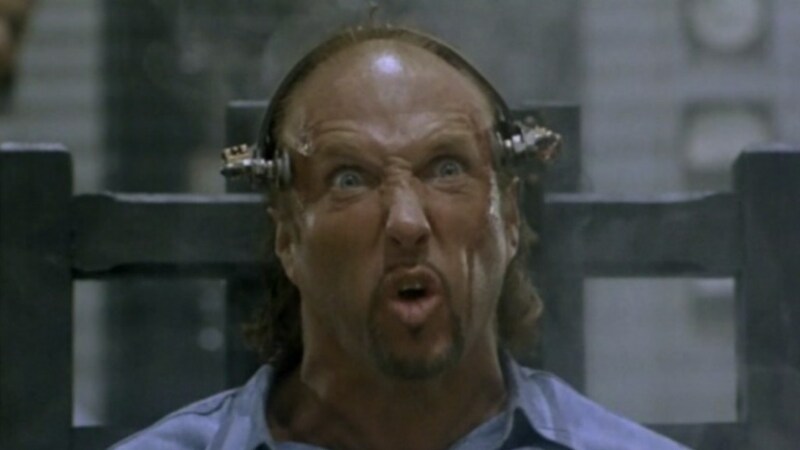 It sets up the film well, with McCarthy wondering if he's losing his mind or not. After Jenke goes to the chair, swearing revenge on McCarthy from beyond the grave, and still not going quietly, it becomes obvious, quickly, that Jenke is now haunting McCarthy. 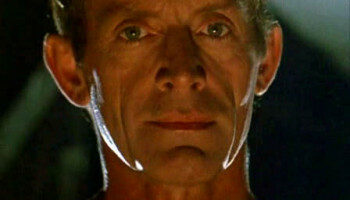 Lance Henriksen (Aliens) holds the lead well. Made around the time that Henriksen's career was taking off - going from mostly TV bit parts to Aliens and Near Dark - it's a solid addition. Brion James (Blade Runner) is fabulously over the top, playing Jenke as a cartoonish villain, but not one you'd want to laugh at. Not to his face, anyway. Supporting the leads are Rita Taggart (Mulholland Drive), Dedee Pfeiffer (Falling Down), and Aron Eisenberg (DS9) as the family, and they all do a solid job. A Notable addition is Thom Bray (Prince of Darkness). 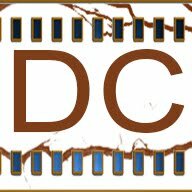 Directed by James Isaac (Jason X) and with Sean S. Cunningham's production company behind it it has pedigree. And it is actually good. It's pretty gross in places, and pretty damn terrifying in others. The SFX hold up today, and from a schlocky start through to the emotional end it's a decent ride. You need a beer with it, and don't take it too seriously - but great stuff once again from the 80's.